Now that I’ve started my own large, non-trivial application, more problems quickly become apparent–how do you structure an application, handle communication? The overall infrastructure becomes vitally important. 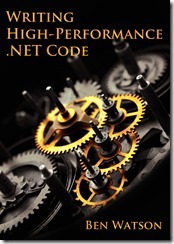 Unlike DocView in MFC, .Net does not have a standard MVC-style architecture to build on top of. It makes no sense to iterate over and over to come up with patterns that others have already solved well. It takes a lot of work, but refactoring code whenever you can/should really pays dividends. I’m doing this in my current personal project, and even though it’s taken a few hours to do some of the major refactoring, it was worth it because implementing new features becomes nearly painless once the structure of the code allowed it. It’s a little harder to do at work, but I have done a little. I want to take this to the next level by always taking the time to restructure the existing code whenever the opportunity presents itself. Thankfully, I’ve spent a lot of time developing unit tests. This will help me use design patterns more thoughtfully, as well as become familiar with some of the more esoteric refactoring patterns in Martin Fowler’s Refactoring. There are too many good books to name, but those are two of the best ones. I go through books quickly. Some books are worth reading over and over until the concepts become part of you. Of course, for that to happen, you have to actually implement the ideas into your projects. I definitely learned things in Code Complete my first time through that I have made part of me–so much so, that I probably couldn’t tell you what they were. But I know I could do better. Huh? That’s not related to programming! au contraire! Self-improvement is a lot more than learning more about your field–it’s training your body and mind to be in better shape. If I feel better, I think better. Now that I have my iPod nano and all the podcasts I could want, I have no excuse not to exercise more than I do. I’ve been getting better, but I have a ways to improve. A healthy body directly correlates to a healthy mind. Another one that isn’t really about programming?! Not so fast. I’ve built Legos for a while, but rarely have designed and built my own models. That needs to change. I have 12,000 Legos–I need to be exercising creativity, design processes, and hard work to achieve some original results. And I want to have fun. Look into WPF — maybe good for UI for my BrickBuilder project? learn more about COM. This has been slowly fading on the priority list. Is there a good reason to learn about COM these days, other than legacy support? Continuous integration — I want to know more about it, but not sure how it would fit into our scenario at work. Once we get our staging server up, it might be a better fit. This entry was posted in Software Development, Tips and tagged Books, creativity, exercise, lego, programming, reading, refactoring, Tips on July 31, 2007 by Ben. Awesome! We started doing katas @ work to make us all better developers! Check out http://codekata.pragprog.com/ and I have a post here http://blog.doylecentral.com/?cat=2 and http://willcode4beer.com/ for the salsa. If your interested we can include you? We so it in Java but it would be cool to get the C# .Net solutions and learn from that. Let me know! Me and the willcode4beer guy will be setting up a place to do these more formally soon. As we are on opposite coasts.